Author: “Member of the Aristocracy” True author is still unknown. Publisher: Frederick Warne and Co, Ninth edition. Exact date unknown, probably around 1895. Condition: Hardcover, decorative cloth, well-bound, with some annotations inside. External is bright with mild soiling. 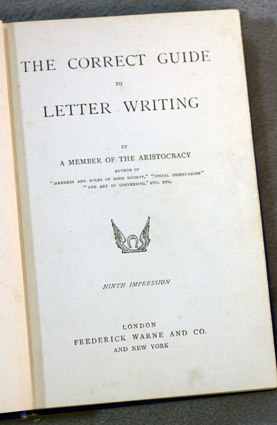 A curious book written by an unknown hand – someone clearly cultured and wealthy, who has written other works such as “Manners and Rules of Good Society” and “Society Small Talk”. 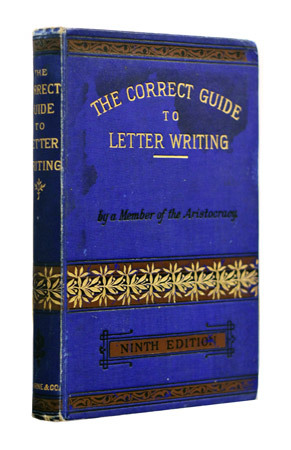 Clearly steeped in stuffy Victorianism, this book is a guide to writing a formal letter to almost any conceivable contact in every conceivable circumstance. Unfavourable answer from a Lady respecting a Proposal of Marriage. ment of to-day, which I have so unwillingly caused you. With best wishes for your happiness.